Leave it to the venerable Economist to continue to scoop the Internet through sheer ingenuity. 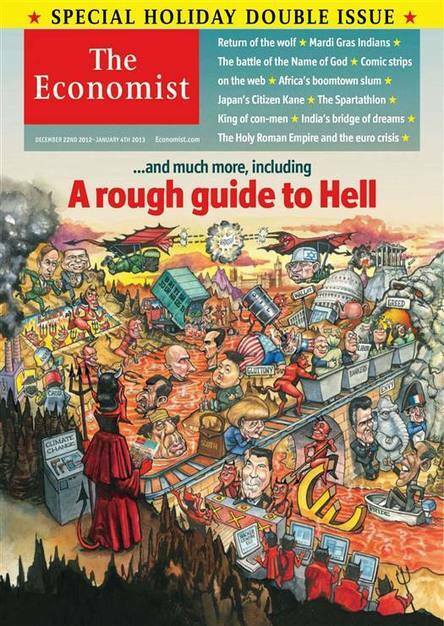 Who but The Economist would run a cover story on entitled “A Rough Guide to Hell,” in its year-end double issue (December 22-January 4). The story is full of wonderful facts and locutions. 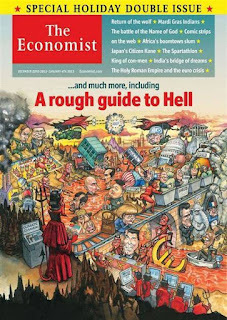 We learn that “Hell has many mansions. Hinduism has 22 main hells…Sinhalese Buddhism has 136 and Burmese Buddhism 40040, one for each particular sin—including noisiness, chicken selling and eating sweets with rice.” And the torture is increased since “the fire of Hell…did not consume what it burned.” And since the soul was immortal there was no escape.” Within the cartography provided— in a piece that analyzes hell with all the journalistic acuity that The Economist might devote to Greece’s economic problems (another hell)— are some memorable locutions. “Hell itself seemed poised uneasily on the very edge of time. Milton, like Hesiod thought that all beginnings and all ends contended just beyond Hellgate, and that night and day met there.” When Descartes “declared that the soul was immaterial," he drove a spike in Hell’s heart and though it doesn’t quite go so far as Sartre’s, “hell is other people,” the article which actually functions for its reader like Virgil did for Dante, leaves us on the verge of modernity quoting Milton “The mind is its own place, and in it self/Can make a Heav’n of Hell, a Hell of Heav’n” and Blake “Hell is being shut up in the possession of corporeal desires.” “A Rough Guide to Hell” is investigative journalism at its highest or shall we say lowest level. Atheists of the World Unite! Cambodia Journal V: Encore What? Is Guilt a Time-Bound Emotion?